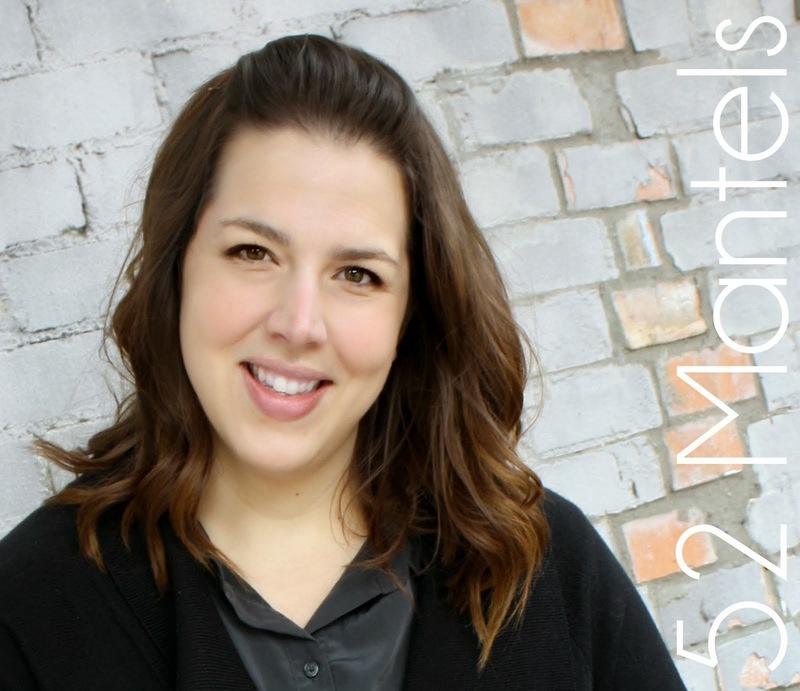 Last week I shared this post at The Grant Life and today I thought I would share it with you! Please go visit Kelley and check out all of the cool gifts shown during her series 10 Homemade Christmas Gifts Under $10. 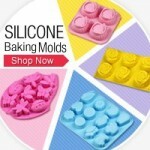 It's not too late to whip something up for someone on your list! I started this project with a hot cocoa mix recipe from allrecipes but, let me be honest, it wasn't good. So, I added, tweaked and changed until I got the right combo of ingredients. I'm not even going to point you to the original recipe since I just called it bad not good. Here's what I came up with: 3 C powdered milk 1- 5oz package of cook & serve chocolate pudding (NOT instant) 1 C of powdered chocolate drink mix 1/4 C powdered, non-dairy creamer 3/4 C powdered sugar 1/4 C unsweetened cocoa powder 1/2 C powdered candy canes* First, let's talk about those *powdered candy canes. I simply unwrapped about 8 candy canes and threw them into my food processor. I hit the grind button and let my little processor take care of business. In the end I was left with a coarse powder, which I added to my cocoa mix. The rest of the ingredients went into my blender for mixing. I used the blender to help break up any clumps. Believe me, you don't want your gift recipient to get a clump of powdered milk in their cup. Yuck! This recipe yields about 6 cups of mix, which I placed in 3 small jars and 1 large jar (filled half way). To make hot cocoa, add 1/4 C of mix with 1 C hot water. 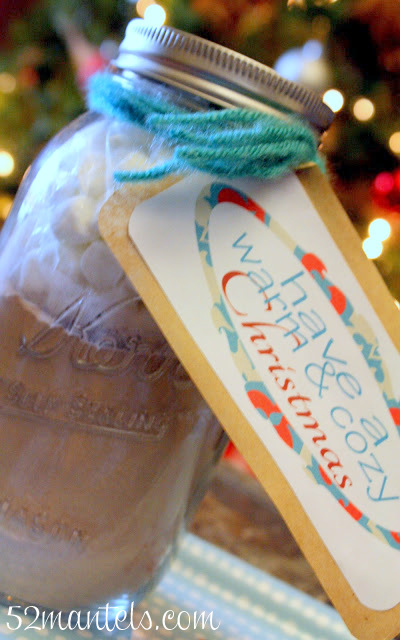 I added some yarn and twine to my jars plus a cute tag. I also included marshmallows in ziplock bags. 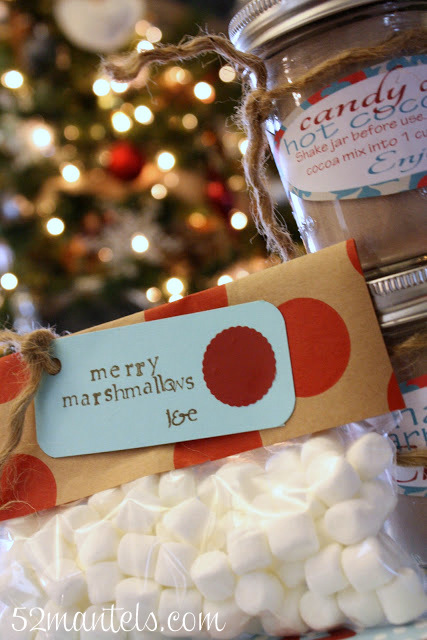 The large jar got the marshmallows tucked inside the jar with the mix and the small jars will be given with the marshmallows on the side. 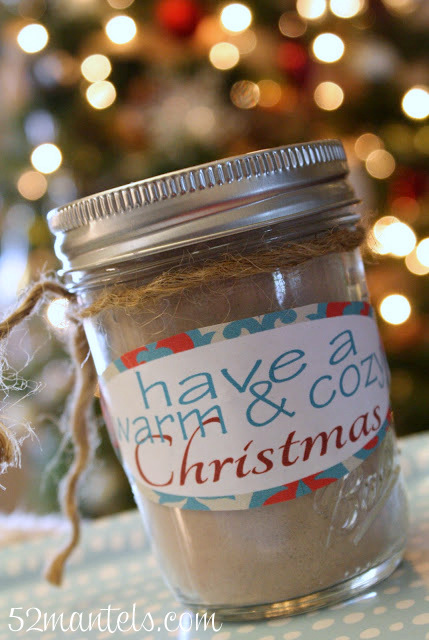 I included two tags with each jar of mix; one with instructions and one with a festive message. And, of course I'm sharing with you! 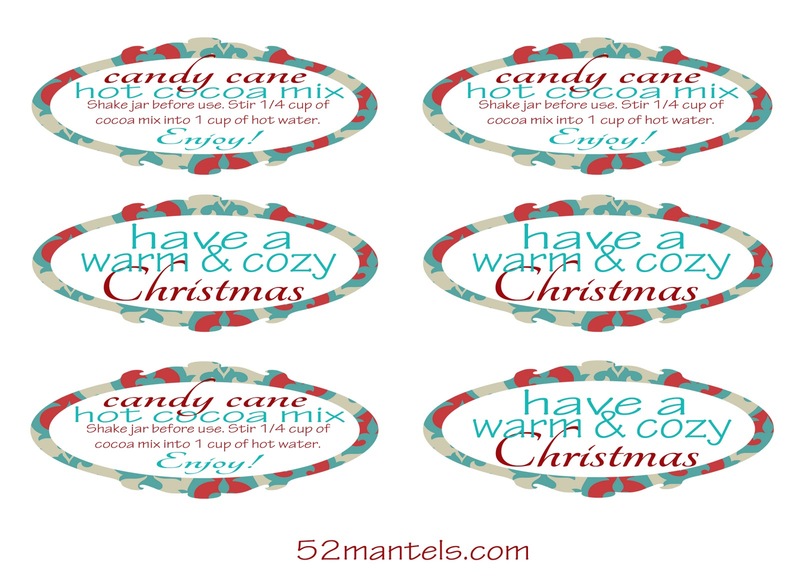 These tags can printed on your home computer and glued onto the jars (I did this with a glue stick) or tied to the jar as with a length of ribbon or twine. I just saw your Ikea platter. It looks so cute. 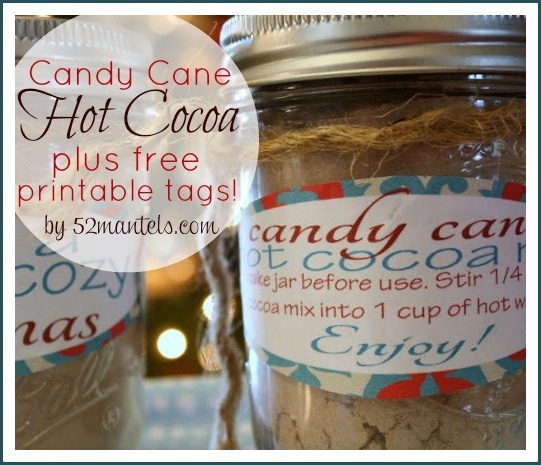 Love the hot chocolate recipe. What a fun spin on my favorite cocoa!! LOVE IT! Thanks for sharing on Overflowing with Creativity! I'm going to pin this for sure!!! XO! a cover, side storage compartments, (which come in handy for items such as dirty shoes), and a cargo net.